Swindon manager Paolo Di Canio says Aden Flint was to blame for their 1-0 Johnstone's Paint Trophy first round derby defeat by Oxford. The 23-year-old had just come on as a substitute when his collision with team-mate Darren Ward led to Alfie Potter's 88th-minute winner. "Flint came in tonight as if he was on holiday and this is not acceptable," Di Canio told BBC Wiltshire. "He has to take the responsibility. We lost because of him." He continued: "It was like on Sunday when we lost for Wes [Foderingham]. We lost because of a stupid moment. "He's a good professional but he has to improve." 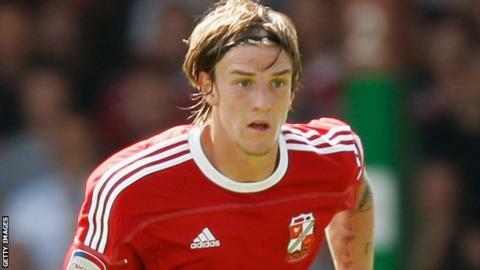 Flint, who arrived at the County Ground from Alfreton in 2011, was first-choice at centre back at Swindon last season, alongside Alan McCormack. But he now faces competition from summer arrivals Ward and Troy Archibald-Henville. Di Canio added: "Flint's a good guy but he's got a big limit. This is why I brought in Darren Ward. "I told them 'don't feel hurt when I bring in new players who can challenge your position'. "Some of my players have to go one step forward if they want to become real footballers. Some of them weren't League One footballers. "They have to know what they want to do in their life."